This is part of an evolving web presence for the Education Program of Canadian Quakers. Over time, Friends will have access here to a variety of resources. The Education Program is administered by the Canadian Yearly Meeting Education and Outreach Committee, which can be reached at e-and-o-clerk@quaker.ca. This six session learning resource will build community among the participants to deepen our understanding of Quaker worship. The course facilitator, David Summerhays, will support an exploration of the early history of Friends, the history of Friends in Canada, Quaker testimonies and their origin, and how our Quaker community nurtures how we live, work, worship, and transact business. This course was previously offered in 2012, 2015 and 2016. Although created to meet the needs of more recent attenders seeking to learn more about Quakerism, we believe that even longstanding members could benefit from this course.We welcome inquiries from anyone who would like to learn more about Quaker ways, with priority given to Canadian Yearly Meeting Members and Attenders. Participants will meet once a week for six weeks using either video conferencing or audio conferencing technology. Don’t worry if you are unfamiliar with conferencing technology, the facilitator and the Education and Outreach Committee are committed to making participation in the course as easy as possible for everyone. Early Friends – History (including Canadian) – What are our roots? Participants will be asked to do a short reading before each of the sessions. These readings can be accessed below this text. The course is free of charge, and donations to Canadian Yearly Meeting are of course welcome. For information concerning the dates of the course and how to register, email onlinecourse@quaker.ca. Uh oh, Was That a Leading? There are readings for each session. The full course descriptions, readings and resource materials and facilitator guides are available here. The course includes worship, storytelling, reflections from readings, and the application to one’s own life of what is learned. Published in 2011, Faith and Practice is a collection of writings and quotes selected by Canadian Friends to serve as a living reference of our values, witness, and tradition. This course was developed by Majory Reitsma-Street and Gale Wills as a tool to explore and study Faith and Practice. It was first used in Vancouver Island Monthly Meeting. Friends’ testimonies, discipline, and instruction in faith and practice focus on the positive value of good relationships among us. However, conflicts do arise from time to time, and we hope that Friends will seek to be faithful in addressing these conflicts and walking through them together. Conflict and Struggle in Meetings– a one-session study guide (Part 5 of the ‘Friends Ways’ Curriculum. Guidelines and the first 4 units. 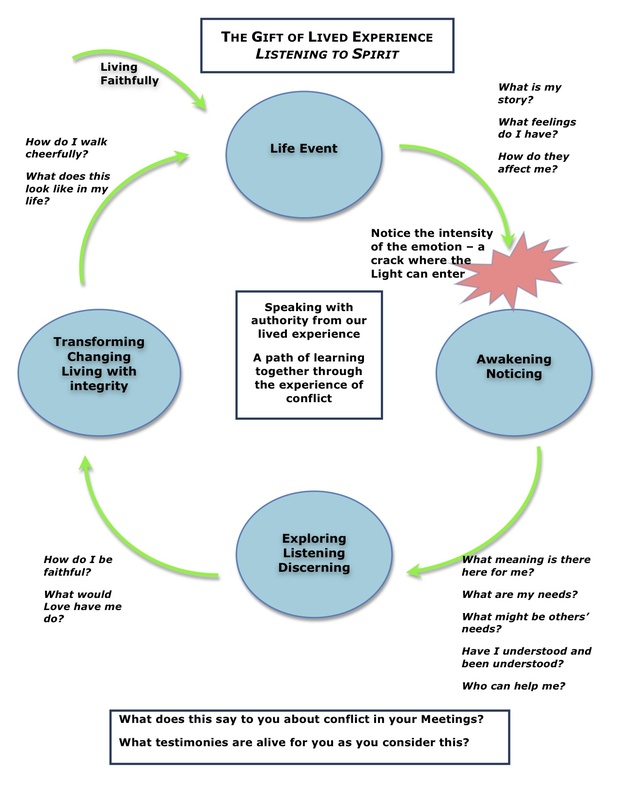 This guide for a 6-part learning session is offered as part of the Canadian Yearly Meeting resources for individual and Meetings in conflict. 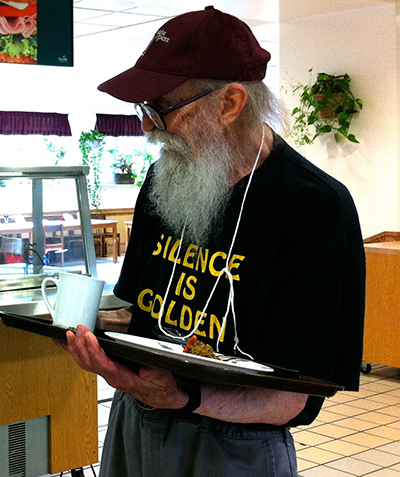 It is based on Quaker Process and the Non-Violent Communication (NVC) approach developed by Marshall Rosenberg. or there is a difficult question without resolution – What would Love have us do? How do we support others in listening, in speaking truth with compassion? How do we contribute to moving through conflict in the Blessed Community? 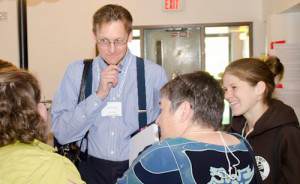 Canadian Quakers gather annually for CYM in Session, where there are many opportunities for learning (more information on the coming year’s program). Quaker or Bible Study (Alternating Years) 4 or 5 sessions on specific topics of interest to Friends. For audios of some of these Study sessions, click here. Sometimes we learn just by being in the presence of our elders. The Quaker Youth Pilgrimage has been active for over 50 years and is known to be a life transforming and Quaker leadership developing experience. It enables young Friends ages 16–18 to learn about Quaker history and process, develop a stronger relationship with God and experience the diversity of Friends’ traditions and worship while traveling, living and working on a service project together for a month during the summer. Jointly sponsored by the Section of the Americas and the Europe and Middle East Section, the pilgrimage takes place once every two years.The FWCC Quaker Youth Pilgrimage in 2014 took place in Latin America. Learn more at the website. For more information on the Quaker Youth Pilgrimage, go to FWCC website. Please contact E&O Grants & Loans Officer for more information.